The initial reaction by a football fan after reading this title above and discovering that its author supports Barcelona and not Manchester City will be nothing short of disgust or outrage. “How can he say that, wanting his club’s best player gone?” “Are you a Barcelona fan or a Messi fan?” “Plastic, glory hunting fan, yet another symptom of the disease that is modern football” etc etc. Messi has won every title at Barcelona at least three times, he’s won the treble twice and is on his way to breaking the final two biggest scoring records in European football. We all expect him to keep winning trophies with Barcelona until his legs stop working but the current situation might turn the footballing world’s longest standing hero into a villain – blamed for his team failures and weaknesses. Barcelona just had the worst summer transfer window in the club’s history, and the motion of censure (to remove club president Bartomeu) that provided one final ray of hope for its fans was quashed by a lack of signatures after half a dozen good matches. Since Sandro Rosell was elected in 2010, the club has entered an unstoppable maelstrom of destruction and while those looking in from the outside would argue that a treble back in 2015 and recent league and cup successes are a strong argument against that, I’d say they’re nothing but the final years of the great work made by Laporta and Guardiola reaching its end. The club lacks ideas on pitch, decisions at board level are disastrous and key players such as Xavi are yet to be replaced, La Masia is barely counted on, and the next bomb to drop is the club’s growing wage bill, which is set to exceed club and UEFA regulations for the second year running. Most decisions by the club these days are quite reactive. Only the loss of Victor Valdes was dealt with efficently. Barcelona is a mess as Real Madrid is becoming even stronger after two consecutive Champions League trophies, adding depth to a squad that’s already ridiculously stacked with talent, they have consistently renewed their squad with some of the best young talent in the world. Meanwhile, Bartomeu continues to make signings that go completely against the club’s model, erase Cruyff’s legacy, projecting a grim future. Culés have to accept that if Messi sticks around, he might suffer for it, and waste the final years of his top level career struggling when other top level clubs are well equipped to challenge for every trophy consistently. Messi has earned the right to decide what’s best for his career. He’s keeping his options open by not signing the renewal and if he judges the best for his final years at the top are better spent elsewhere with a coach, squad and style that he trusts and thrived before, no culé could seriously say he’s in the wrong. 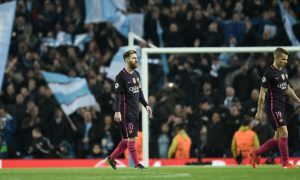 Messi needs change and Manchester City is the best destination. Forget the arguments of playing for an oil funded club, Leo played most of his years in a Barcelona shirt emblazoned with companies owned by Qatar, who not only bribed its way to get a World Cup, but is also using slave labour to build its stadiums. Barcelona’s moral high ground over other clubs was lost in the moment that sponsorship deal was signed, becoming another business, signing deals with the highest bidders without a care for what’s ethically right or wrong. Manchester City is currently managed by Guardiola, who helped Messi become what he is today, controlled by Ferran Soriano and Txiki Begiristain, part the core that made Barcelona rise after years without trophies and globalised the club while maintaining its loyalty to the model created by Johan Cruyff. There’s no better place for him to experience his final years on a high. Leo playing in the Premier League, the most watched league in the world, would be the best way to cement himself unanimously as the Greatest Of All Time. Most of the footballing world would be able to see Messi beyond his goals and assists, and discover his season highlight reel extends to hours. Forget those arguing he’s had an awful season because of a bad match in the Champions League. The Manchester club exceeds on marketing and would help the player’s legacy like Barcelona has failed to do for nearly a decade, helping to manage his image correctly and strengthen his brand worldwide, helping him achieve a sustainable long term future after retirement. His presence in England would change the league forever alongside Pep, who left two years after the Rosell and his people started to destroy the club. Finally, after joining Manchester City and Guardiola in England, Messi would finally gain even ground with Cristiano Ronaldo when it comes to strawman arguments such as proven in multiple leagues, and easily surpass the Portuguese player’s legacy in the Premier League, which frankly wouldn’t be difficult even after his thirties. 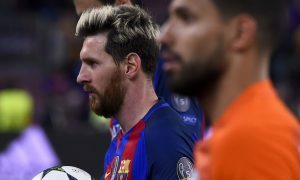 Professional footballers turned celebrities normally follow a path of partying, travelling, picking up women, but Messi is incredibly shy, humble and only wants to play football, preferring to stay home with his family. Taking that into consideration, it’s likely that Messi will sign his renewal and retire at Barcelona rather than be selfish and picking to end his career on the best terms possible even if that meant living the club of his life when they need him the most. Maybe that’s what makes Messi uniquely special, he’s been constantly sacrificing himself for Barcelona and Argentina, doing what’s best for all of those around him rather than doing what’s best for himself. We live the sport everyday, we have become accustomed to footballers heartlessly changing clubs and we are so self absorbed into wanting what’s best for our club that the little Argentinian might end up being revered not only for his magical dribbles, goals, assists and trophies, but for being legitimately genuine in a sport that seems to constantly punish those that don’t obey its unwritten rules and that is constantly accused of being detached from what made it so great. Manchester City or not, Lionel Messi will always own his destiny.